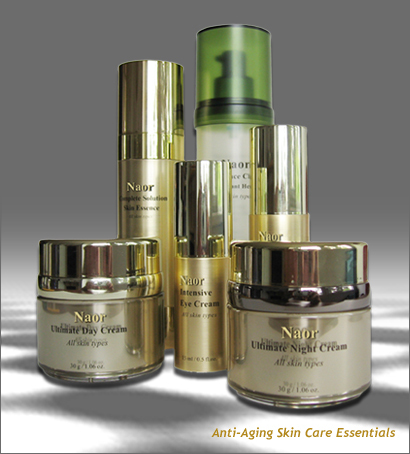 Naor Skincare Science Inc. Naor Skincare Science Inc. | Anti-Aging Products. NAOR IS SUPPORTED BY THE CANADIAN FEDERAL & PROVINCIAL GOVERNMENTS FOR RESEARCH AND DEVELOPMENT OF ANTI-AGING SKINCARE PRODUCTS, USING NATURAL FERMENT PRESERVATIVE, STEM CELL CULTIVATION AND ORGANIC SUBSTANCES THAT ACTIVATE KEY ANTI-AGING GENE BY BIOTECHNOLOGY. Most cosmetics have a shelf life of at least 2 to 3 years due to the long commercial storage process. As a result, they have a high percentage of chemical content. Naor fresh cosmetics break through these limitations - made fresh and shipped directly to the consumer in much less time. Therefore, the skin is not polluted with harmful chemical preservatives, solvents, talc, silicone, mineral oils, etc. Instead, it is pampered with fresh, natural, certified organic ingredients and the latest biotechnology for excellent anti-aging effects. How Naor is changing the face of skincare?